This is stunning! LOVE how the colors shimmer and shine!! A true work of (he)art! TFS! It's great and really pops out. Lovely card. Love the colors used. Wow ! Be still my colorful heart! Love it. Wow... gorgeous colors on this beautiful card! Love the heart image and sentiment! Fabulous use of the MISTI to re-stamp and then emboss in gold! Great look! So beautiful!! Love the effect! Beautiful card! Love the colors and gold embossing! Love that pop of color on all that white. And with gold embossing. Just gorgeous! I happen to have this stamp, and Wowee! Does yours look fantastic being colored with the Chameleon pens. I didn't realize how important these pens were until I saw this card..they make coloring so easy. Now the tips on the MISTI. That's a Wowee also. If a person had a Misti, they could use your brilliant tips and come out with a fantastic looking card. Thank you for everything. I need some of those faceted stamps! Love the gold embossing! Your coloring is spectacular! Love the graphic design, beautifully done!!! Gorgeous Maureen. I love the coloring. The Chameleon pens really give great dimension to the heart! Love it! Maureen this is such an amazing card. 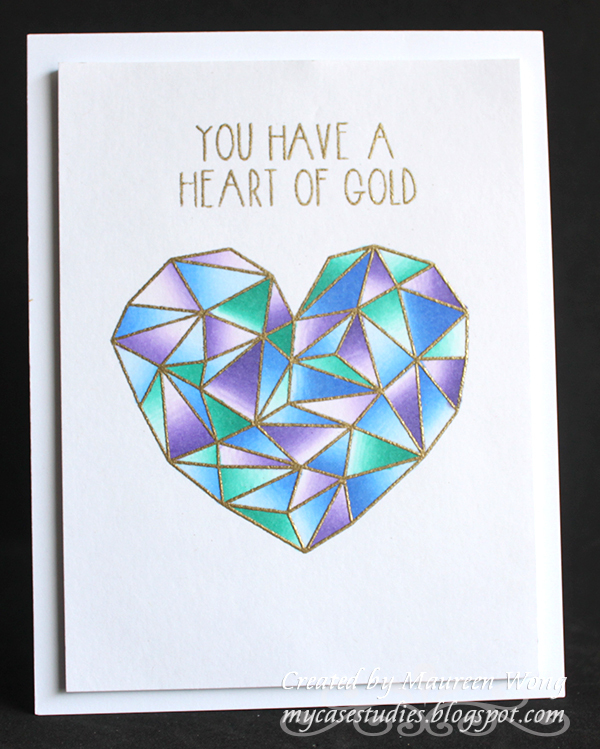 It looks like a beautiful jewel once the faceted heart is coloured. Thanks for sharing how you did it. The leaving it in place and restamping the image after its coloured makes such a difference. Lovely card! Such gorgeous colors! I've never thought of over stamping an image after coloring, I'm going to try it! Love that stamp and the colors you chose are perfect. Nice card. Love your card. The colors you used and the blending are fantastic and the gold embossing finishes it off beautifully. Thank you for being part of this giveaway. Gold is always in. Nice colors. sets the tone for the card. Beautiful coloring. The gold embossing really makes them pop. Such a pretty card, lovely colours. That color combo is amazing! Love, love, love this. My favorite colors. I love Gold and Hearts so very pretty! WOW! Those pens are amazing! This is so beautiful Maureen, a great card! Maureen, your creativity never ceases to amaze me. I'm always wondering what you will come up w/ next. :-) This is absolutely gorgeous --- the choice of colours and then, w/ those amazing pens --- beautiful!!!! :-) TFS! Wow! Lovely! Your colors are amazing! Great card with beautiful colors and love the embossing! Very pretty card - love the colors and gold embossing ! That stamp really works great with the Chameleon markers. I love it Marleen. Very lovely card - love the colors and the gold embosssing !!! Very Pretty card...love the colors!!! Love your pretty colors and the gold embossing ! Thanks so much for sharing with us, Maureen. This is a very exciting hop and giveaway! Very pretty colors and I like how you used the Misti. Beautiful card! The colors just jump off the screen with shimmer! great job! Beautiful coloring! Perfect sample! Will have to add to my wish list! Spectacular the gold with the beautiful colors, love it!! WOW! Great coloring of the Hear of Gold heart. It is wonderful. It makes your "simple" card seem very elegant and not so simple!!! Both the Misti and Chameleon Pens would be a great addition to my crafting supplies. I would love the opportunity to,win both. Thanks for making it possible. Love this card! Speaks to me on all levels! Beautiful! Looks like stained glass. This is really pretty! I love it. So glad to have found your blog - it's going on my reader list right away. Thanks. The card looks great and I learned another technique. I never would have thought to stamp the image with regular ink and then re-stamp and heat emboss it after coloring. Definitely a new trick to add to my techniques grabbag . Thanks so much! Oh my goodness, this is GORGEOUS! Looks like stained glass! Wow, I love your gorgeous card--beautiful colors and coloring! You've inspired me to try the chameleon pens! The Chameleons really bring out the beauty in that wonderful stamp!! Gorgeous card! I have never tried those pens. Just may be time to start! Love how you took a flat card and gave it such dimension. This is such a creative design, I love how modern it is and the the way it looks almost 3d.